By popular demand, bleachers in upper-level sideline sections 211-217 and 228-234 will be completely removed and replaced with more comfortable chair-back seating through a project that will be complete prior to the 2019-20 season. Further, upper-level sidelines will be completely reconfigured, allowing for less seats in each row and more aisle seating. 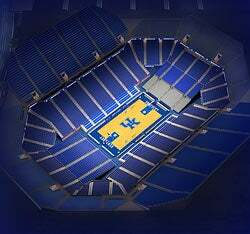 UK Athletics is excited to unveil the all new Rupp Arena Virtual Venue. This platform allows fans to see 360-views from various seat locations, compare sight lines and see the benefits & amenities associated with each seat location. Please note, pricing will be announced at a later date prior to seat selections.